The Centenary of the start of WWI has not surprisingly produced a large volume of books that rake through every conceivable aspect of this historic conflict. For the reviewer, battle fatigue can set in early on, but this centenary has produced some fine books, reprints of valuable insights that had faded from libraries, and a number of fresh insights. The epic scale of the conflict means that there are yet more insights to emerge as we move towards the rash of books that will be published for the Centenary of the End of the Great War. This book sits firmly in the upper reaches of those so far published. The author has researched well and this volume is worthy addition to his catalogue of WWI accounts. SUBJECT: WWI, First World War, World War One, 1918, German Army, Somme, Western Front, The Great War, German Spring Offensive. DESCRIPTION: The Centenary of the start of WWI has not surprisingly produced a large volume of books that rake through every conceivable aspect of this historic conflict. For the reviewer, battle fatigue can set in early on, but this centenary has produced some fine books, reprints of valuable insights that had faded from libraries, and a number of fresh insights. The epic scale of the conflict means that there are yet more insights to emerge as we move towards the rash of books that will be published for the Centenary of the End of the Great War. This book sits firmly in the upper reaches of those so far published. The author has researched well and this volume is worthy addition to his catalogue of WWI accounts. 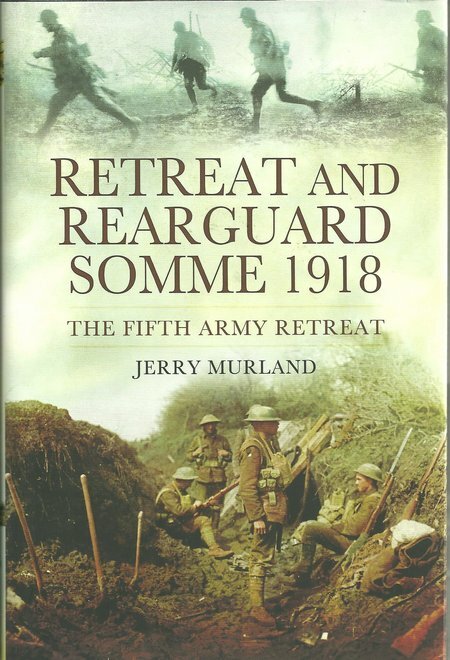 The author has painted a vivid picture of the actions on the Somme in 1918. He has brought out the unit and individual courage, the terrible conditions, and given graphic detail of the British, Irish and South African regiments. He demonstrates that so much has yet to emerge from this Great War, even one hundred years on. The book is a valuable companion for battlefield visitors and, if anything, battlefield visits not only continue to be popular, but are increasing in popularity. There will continue to be many conflicting views about particular elements of the war and this period of the German Spring Offensive may well be one of the most contentious. After the lengthy stalemate on the Western Front, the Allies had been steadily gaining the upper hand. Then, the Russian Revolution changed everything, freeing up the German forces on the Eastern Front. It made possible the German Spring Offensive of 1918. There have been claims that the US finally rode to the rescue, but the reality was probably that green US troops partly balanced the experienced but ill-led and ill-equipped, Russian troops, who were no longer fighting the Germans. The German Army preformed a major movement of troops in bringing such a large force across Germany from East to West. However, the Allies were able to roll with the punch and then move back onto the offensive, leading to the German surrender only a few months later. The fighting retreat on the Somme bought time for the Allies to reform and re-supply to go back onto the offensive, and it also wore down the German soldiers. The author has captured this very well and the text is supported by maps and a photoplate section.